No matter what handheld device you possess, an iPhone, iPad, iPod Touch, or Android, there's one tool that makes easy work out of ripping DVDs and converting incompatible video files into manageable formats: Handbrake. This awesome pro has just about everything you could ask for, including powerful compatibility, an intuitive interface, and sound performance. And if that weren't enough, it amazes you at its downright free of charge, with no strings (or trialware) attached. Maybe you have already used Handbrake before, if not frequently. Or you just heard about it once in a while, whatever. But do you really know how to use Handbrake 1.0.0 to rip and convert DVD/video on Windows? How to convert DVD and video to iPhone iPad acceptable formats with slightest efforts? Well, I do. So in the following article, I will guide you through the procedure of using this high quality DVD ripper - Handbrake to rip and convert DVD/video on Windows PC. Handbrake neither rips copy protected DVDs nor supports the latest devices. Try the best alternative to Handbrake - MacX DVD Ripper Pro to rip protected DVDs to iPhone 7/7 Plus/6s/6/SE, iPad, Android Samsung, PSP, MP4, etc. with original quality reserved and 36X faster speed. At the first place, go to Handbrake download website to download this free DVD video converter on Windows (Handbrake latest version 1.0.0 recommended). 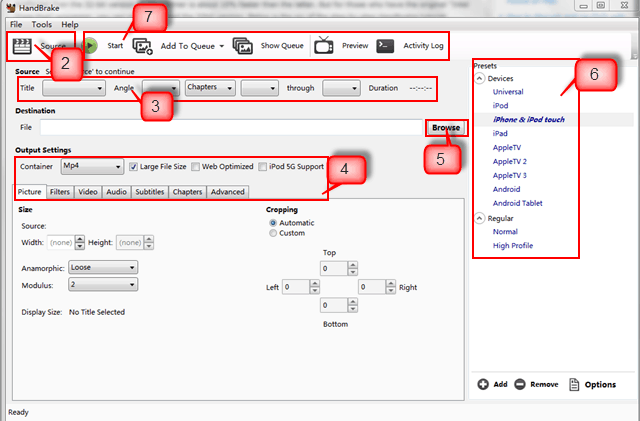 Then, after downloading Handbrake 1.0.0, install it and prepare to convert your DVD or video with Handbrake. If you are working on a Mac, please follow the Handbrake tutorial to rip DVD on Mac. Now, you're asked to import source to Handbrake. When it comes to rip and convert DVD to MP4/MKV with Handbrake on Windows, you have three options. 1). Click "Source" button and import your DVD disc into Handbrake for ripping. 2). On the condition that you mean to convert your DVD video and don't own DVD disc in hand, you can choose to lead in VIDEO_TS folder instead as Handbrake also works well with VIDEO_TS folder. 3). Maybe you have already ripped DVD on Windows and you just yearn for converting DVD videos to other mainstream video formats, you can utilize your ISO image to reach it, which is cloned from DVD with 1:1 lossless quality to guarantee the perfect video quality. To convert video with Handbrake, simply click "Source" button→"Open File" to import the video source. By far, Handbrake supports MP4, MKV, VOB, AVI, TS, M2TS input video solely, and it's powerless to convert video purchased from iTunes or video in other file forms. Thus, if you insist on converting video like MOV, AVI, FLV on Windows PC, it's advisable to seek assistance from a versatile yet first-rate video converter. Notice: Only DVD with no copyright protection tech involving can handbrake 1.0.0 rip and convert. Any new DVD releases with DVD encryption tech, Handbrake is paralyzed to decrypt and rip it standalone. Certainly, the third party like VLC can assist Handbrake to accomplish DVD decryption, so you can resort to it or other reliable DVD ripper for help to rip encrypted DVDs. As you know the DVD source may contain a raft of titles and chapters, and usually Handbrake will automatically pick out the main title for you. If you just need to rip and convert a part of the video, you can decide the duration by selecting chapters, seconds or frames. At times, chances are that Handbrake fails to select the main title for you, if you rip copy protected DVD with CSS, DRM or Disney New protection tech. In this case, maybe user guide on Handbrake no title found issue will do a nice job for you. Handbrake offers you with two container formats to choose: MP4 and MKV. Plus, you are also free to choose converting DVD or video to H.264 (x264), MPEG-4 (FFmpeg), MPEG-2(FFmpeg) as your output format. Well, if you barely want to rip and convert DVD or video to music, you can approach to AAC, MP3, AC3 and DTS totally at your disposal. 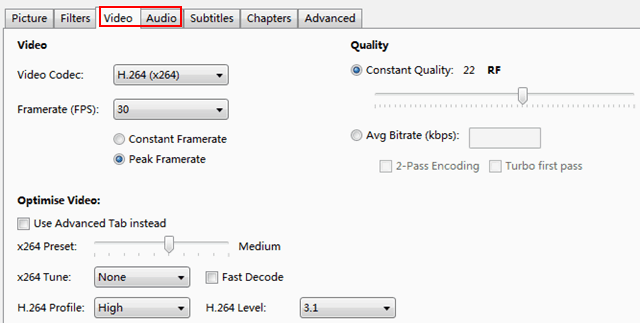 More incredibly, there are other optional settings for you to customize your output video, such as tweaking your output image by shrinking the image size, adding self-made subtitles or creating chapters and more. Press the "Browse" button to specify the place where the output video goes. As you can see, there are multiple devices provided for you to better address your demands on output video format. 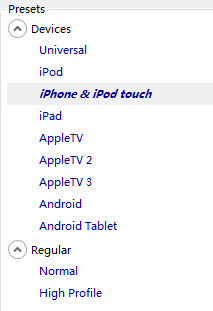 No matter the warmly received iPhone, iPad, iPod, or the prevailing Android devices, you can choose any one as you like. Meanwhile, "Universal" is better for outputting videos for enjoying on mobile devices while "Normal" and "High Profile" are especially provided for watching on computer or TV. 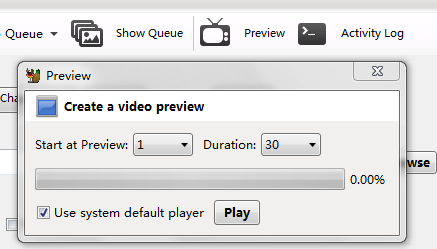 After all the above steps done, you can have a previewing on the output video by hitting "Preview" button and then you can select the beginning and end time to preview. When previewing is over, and you feel satisfied with all the video effect, then you can finally click the "Start" button and commence DVD video converting with Handbrake 1.0.0 on Windows. There's no gainsaying that Handbrake is an excellent free DVD ripper yet video converter. But everything is imperfect, and so is Handbrake 1.0.0. When you are using it, you may encounter a boatload of troubles. Here just illustrates some cool solutions to tackle them one by one. Note: Beyond ripping DVD with Handbrake on Windows, if you still hunker for ripping any DVD even encrypted by CSS, DRM, UOPs, and Disney New Protection tech on Mac OS X without any third party participating, here an incomparable yet feature-rich Mac DVD ripper-MacX DVD Ripper Pro is surly your cup of tea. And to convert SD and HD video to far more video formats namely AVI, FLV, MKV, AVCHD, MTS on mac, MacX Video Converter Pro is the second-to-none choice for you. After ripping DVD on PC with Handbrake, you can use MacX MediaTrans to transfer video from computer to iPhone iPad iPod for playback with ease. Besides, this iPhone file manager also allows users to painlessly manage other files on iDevices including music, photo, eBooks, ringtones and more. This tutorial centers on two ways to convert video on Mac with Handbrake and MacX Video Converter Pro and shares a detailed comparison about the two video converters for Mac, so that you can convert MP4, FLV, AVI, MKV, M2TS, AVCHD, etc for iPhone iPad Android on Mac easily. The best DVD ripper 2016 - 2017 review compares top 3 DVD ripper software for Mac and PC and details on how to rip DVD to Mac, Windows Media Player, AVI, MP4, H264, MPEG4, MKV, MOV, WMV for your phones, tablets and game consoles. MacX DVD Ripper Pro is the best Handbrake alternative which can freely rip and convert any new copy-protected DVDs to various video formats (MP4, MOV, MKV, AVI, FLV, etc) and portable devices with original quality.